Photo courtesy of the Photographer, internet & relevant website. it looks recent but may not be. 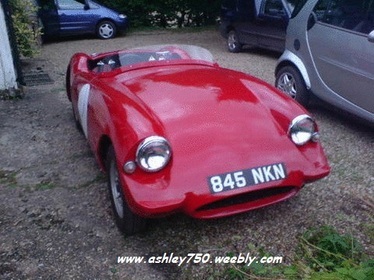 I have had the photo in my photo system since November 2011.
same car, all from February 2008. "A fast sporting Car for Competition with 1275 Midget/Sprite Engine, front and rear axle. 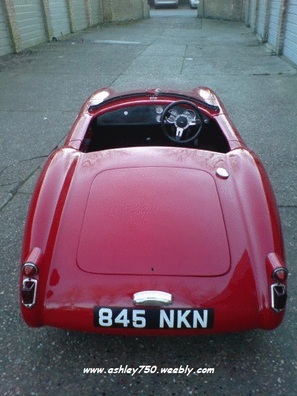 The Ashley 750 Short wheelbase was made in 1956 only. Then available as Falcon Mk 1 (another manufacturer). 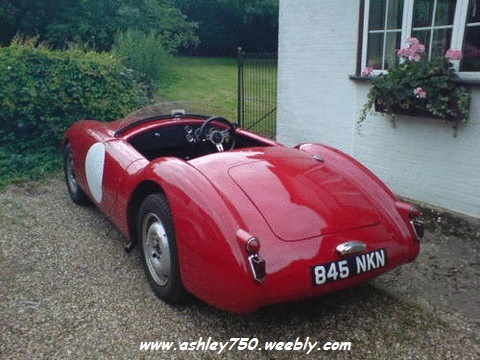 The Ashley 750 Long wheelbase was made from 1956 to 1962." The photo of the front view of the car seems to ask a question that needs answering, " where did that bonnet come from ??? " I raise this question because it is like no other Ashley 750 bonnet that I have ever seen, it appears to be a front hinged, forward opening whole bonnet and wings, not unlike the principle to be used later on the 1172 and Sportiva. Is it perhaps a bonnet from another makers 1960's special, used after the original had been crashed or a home designed replacement to improve the looks, if anyone knows the answer please email me so that I can add it's story to this page.